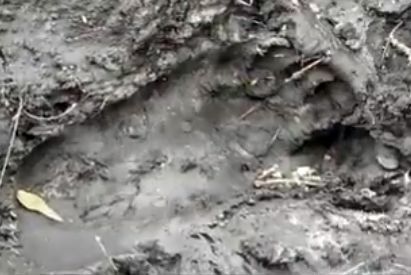 Master Skunk Ape Tracker Tim Fasano shows us his alleged Skunk Ape Trackway that he found while out Squatchin' with Kevin Kehl. Could this be the largest Bigfoot trackway ever found? Do you know of a larger one? Feel free to comment below. It was found in Florida by our team. Kevin and George went to an area in the Green Swamp that I directed them to, and they made a historical find. The trackway stretched over 600 yards and contained several hundred prints. Different sizes indicate this was a den of Skunk Apes moving thru during migration season. The prints, also, indicated herding activity as they hovered to protect their young. The bigger foot he pointed out looked to have claw marks at the tip of those toe marks! Are there bears down in Fla.